Made from 316 marine grade steel and 10mm toughened glass. Clear glass is supplied as standard, or you can have a different look or privacy guards with sand-blasted (frosted / opaque) glass for an additional £25 per metre. Glass opening / door available (see photos below). Allow 2 weeks for build and delivery. Delivered to your door with everything included, delivered ready to fit. We can advise on correct size for your project when taking your order, based on your own measurements or photos. Delivery charge is £40 per order to the UK mainland, and normally £80 to other locations. Sand-blasted frosted/opaque privacy glass option is available for an additional £25 per metre. Unlike most of our competitors, there are no other charges. All prices include VAT, fixtures and fittings, etc. All major cards accepted – no extra charge for credit card payments. 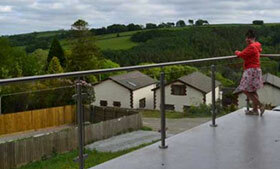 The pricing tool below has an example range of balustrade sizes, but we can supply any size you require.